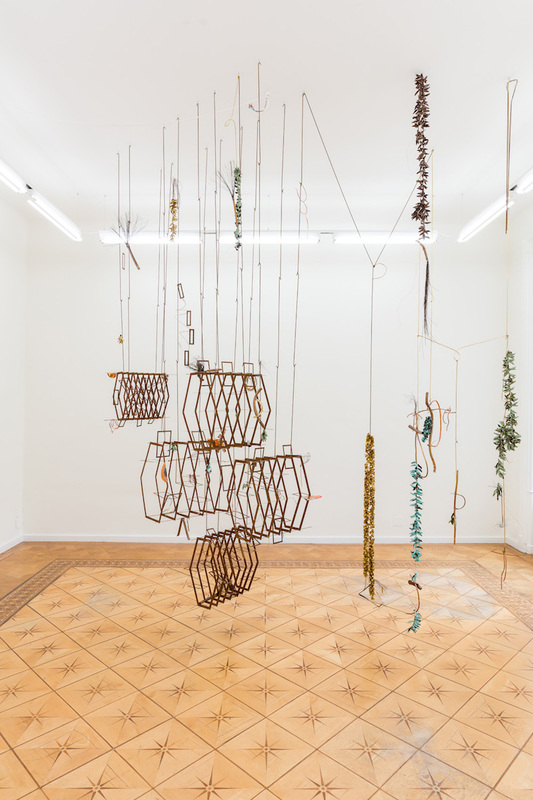 View of "Iza Tarasewicz: In myriads, things cry out,” 2018. There’s something almost brash about the gorgeousness of Polish sculptor Iza Tarasewicz’s rusted steel, copper, and brass constructions. In this exhibition, “In myriads, things cry out,” numbered forms suggest foliage from, or ornaments for, a fantastical garden. Seemingly left to grow wild, they’ve sprouted their own ecosystem while adapting to artificial surroundings. Dangling from the ceiling and walls from the artist’s characteristic networks of hooked tubes and tangled wire, each nameless detail is in harmony with the whole. In the main gallery space, rows of five thin hexagonal structures that look like unoccupied birdcages hang at different heights. Each shape has frayed, furry wire or bent pieces of copper attached, like fabulous undergrowth or traces of the creatures that call it home. Vine-like gold, turquoise, and green garlands creep around coiling copper tendrils and, by the doorway between the main space and the anteroom, leaves twist around three metal bamboo sticks propped against the wall. Smaller pieces, where the oxidized copper is forged into snarled bundles of twigs and branches, look spookier, like wooden signs left in the forest to ward off intruders. Elsewhere, swaying cylinders resemble wind chimes suspended from curved metal branches, themselves affixed to the ceiling by meandering copper poles. Tarasewicz does not fetishize the organic look of these pieces, which reward close, almost laborious, attention. Instead, she asks us to glory in her sublime garden while remembering that it is, ultimately, a mute rendition of the cries of nature to which we are already deafened.